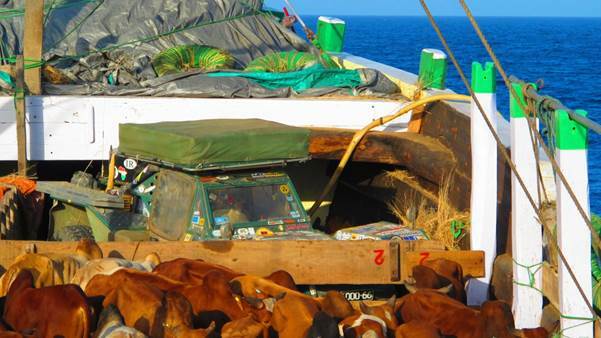 Date: 13th March 2013 on a DHOW with 450 Cows, 2 goats, and 13 Indian crew, and poor Elayne the only women on-board…..for 4 ½ days. The excitement of leaving the Berbera Port Somaliland late at night on an beautifully painted Indian Dhow to cross the Gulf of Aden and the Arabian Sea was every adventures dream…….well I would not say every adventure…Elayne was not happy contemplating all the men and just one woman onboard this Dhow, but there was nothing else I could do …and our passage on the Dhow was free….yes free. We only paid the Port fees and crane one lift for Victor, a total of USD$100.00. In 2013 a trip carrying you and your car for 4 ½ days at sea including food and shelter for USD$100.00 is pretty good value. 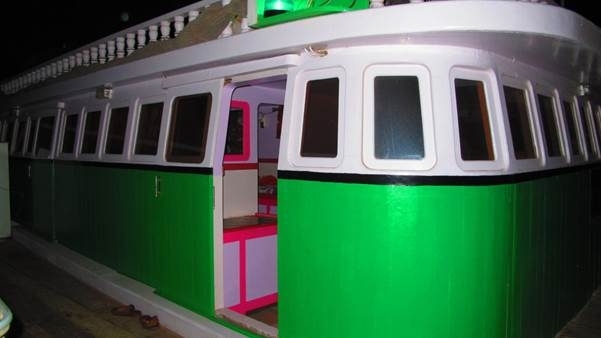 The bright bridge on our Indian Dhow Nooralsalah. Cooking quarters for the whole crew. 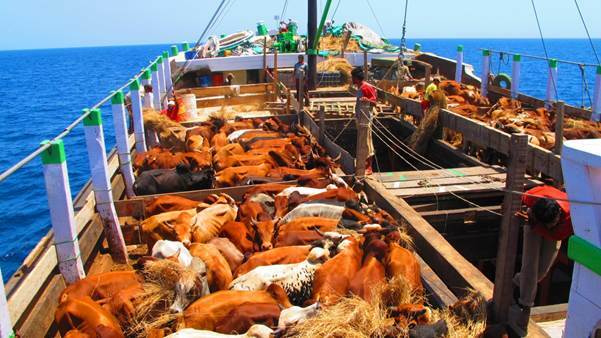 Victors new home at sea with 450 Somaliland Cows. 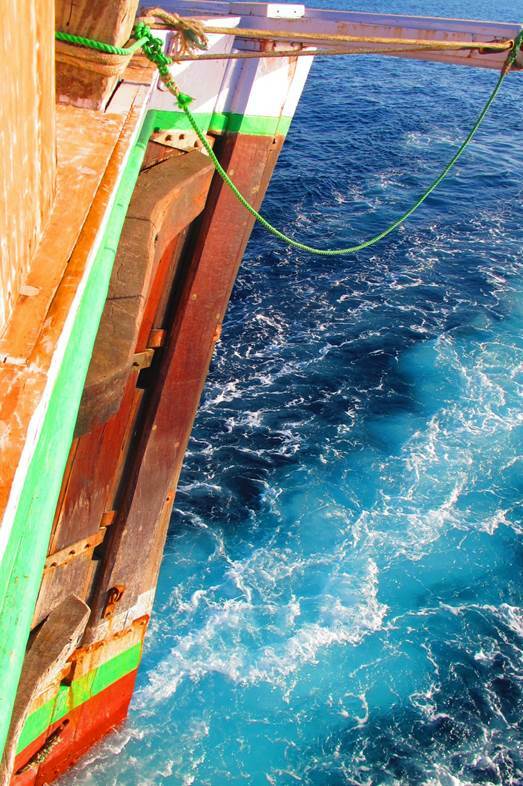 The Thunder box high above the sea….No Elayne is not going to use this part of the Dhow. Crew sit watching the cargo of Cows. Evening falls the first watch takes up their position. 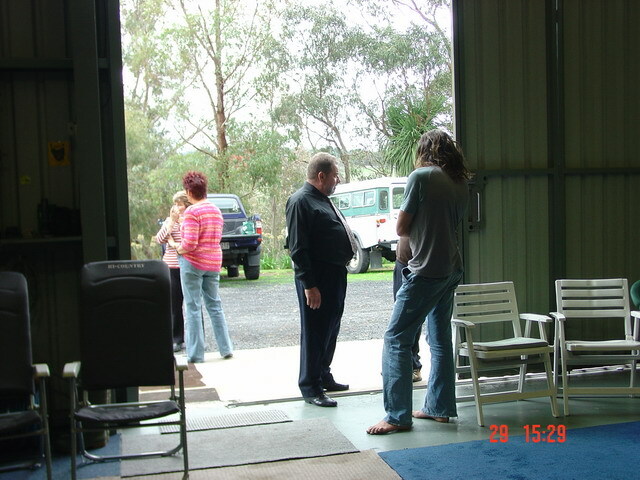 I look at Elayne who is saying good bye to our 2 new Aussie friends who we had just met for the day. 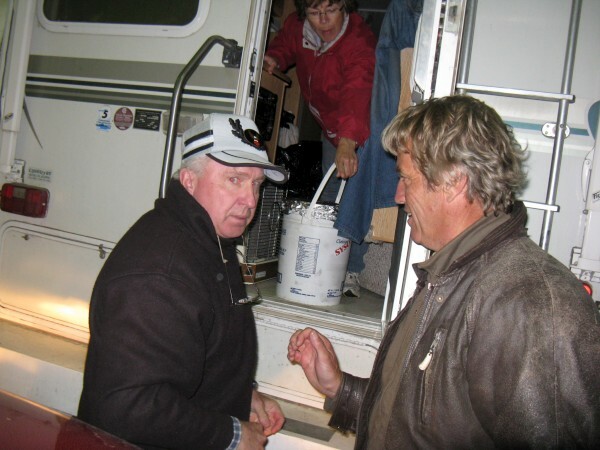 Jurgen and Linda had chased us down from Ethiopia and finally caught us at the Hotel Maan –soor. It was amazing they found us and we enjoyed there company for a few hours before we had to say our goodbyes at the wharf. Jurgen was pretty impressed how good the Dhow was and what a great place we had nestled in on the front Starboard side on top of a small Haystack. It will be just great Jurgen exclaims you have a great spot on the Dhow it will be a true adventure. Jurgens words ring in my head the days events leading to this point a whirl-pool still my mind trying to work out what happened. It was an amazing sight to watch these Cows being rounded up in the night 20 men slinging them until together 5 or so at a time are lifted with a crane slowly aboard and then lowered out of sight into the empty hull. It was the same which had lifted us slowly high above the ground Victor now placed on a small Haystack waiting. Victor gets his fare share of straw. 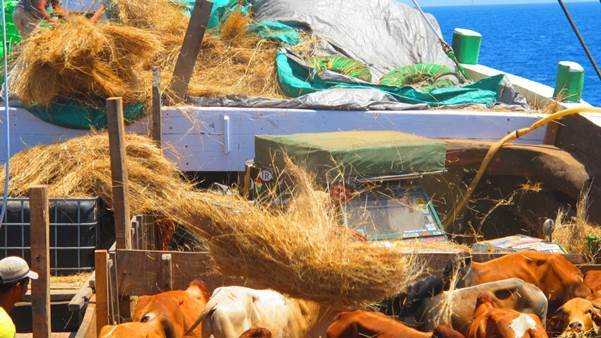 The cows are happy having a good feed after they have their sea-legs. Not a murmur from the cows they were total clam during the whole process not a murmur or complaint was heard. The only trouble you may have is being covered in excrement or Cow urine as they were lifted above the ground spraying all below if you were not quick. The quay was covered in dung and urine, we were Lucky as we dodged several near misses from above… and so glad they where miss’s. It was time for Victor to be slung and lifted by the crane. It was a nerve wrecking experience Watching Victor being hooked up to the nylon slings, shouting and the night confusion was all around me I was not in control as 20 sweaty men pulled pushed and directed the crane drive all laughing at my uncertainty, me slipping around in the Cow dung and Urine. The shouting and whistling from 20 excited Port workers was a harrowing time it looked as if nobody was in control, when in a flash Victor was flying ……it was so quick ….up and up Victor went I scrambled onto the Dhow as quickly as I could trying to see what was happening would Victor fit into the space they had found on the Dhow. My hands were covered in Cow dung as I clung to the wooden runs of the ladder and lifted myself over the gunwales to join another 20 men all screaming at the crane drive who no could see nothing. Victor was swinging around like the Cows the crane drive trying to miss the rigging of the forward Dhows onboard crane. Victor spiralled down bouncing of rigging wires and various wooden structure’s lower and lower finally into the grip of several port/Dhow workers pulling Victor into line. I could see Victor’s air filter being hit as the angle had the rear much lower than the front… watch-out I screamed over to the workers….watchout out but Victors air filter was on a collision coarse with a solid wooden beam which would not budge. It miss’s by some miracle……phew…that was close but Victor had landed safely on a small Haystack and it was all over in a few minutes. 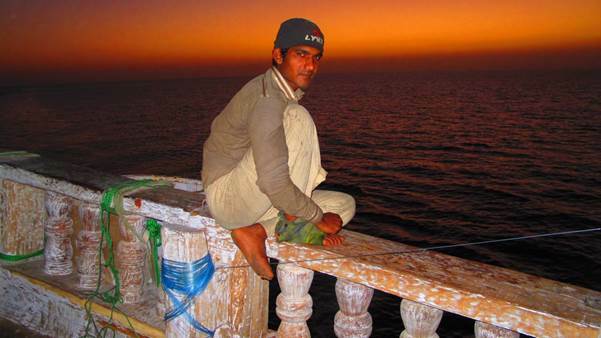 Jurgen climbs aboard and checks out the Dhow…pretty good spot Jurgen approves of Victors haystack position. Linda and Jurgen had stayed through the nail bitting few minutes, but a great shout of joy when Chris had given the thumbs up, Victor had landed on another planet successfully, and it was another world indeed. We wave our goodbyes for Jurgen and Linda as they fire up their Nissan and drive off back to their adventure through Africa. Elayne had manage to climb the vertical ladder on to our Dhow ‘’ NoorealSalam ‘’only with the help of one of the Indian crew who had tied another wooden run between the large gaps of the other runs. This enabled Elayne to climb the20’ ladder although it was still pretty steep and covered in Cow poo. ….Yuk Elayne holds her hand out…I am covered in Cow poo…I laugh …yes me to. Aboard we felt a sadness leaving a beautiful Continent one which we had found peaceful and kind. We understand all travel is personal and subjective to each and no other story can be the same, but for us it had been a fantastic trip one we will remember for a long time. 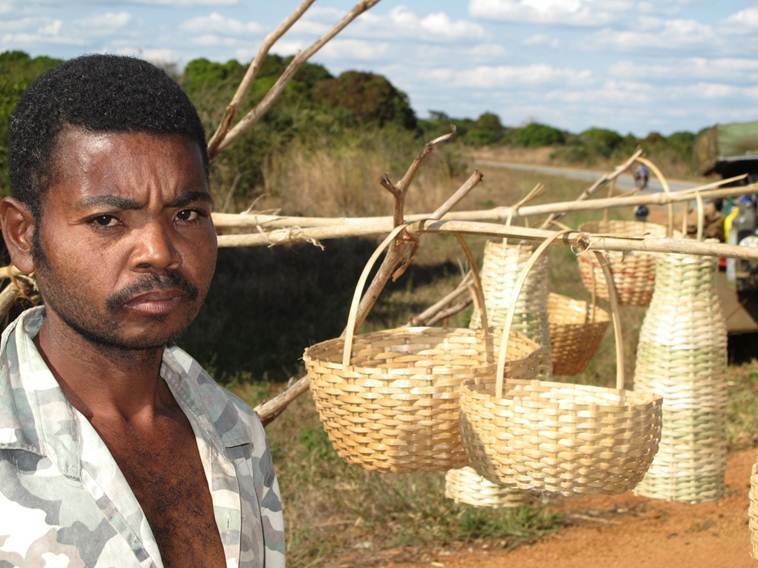 For me the people and Trees of Africa stand out the most and leaving this Continent had brought a lump to my throat. 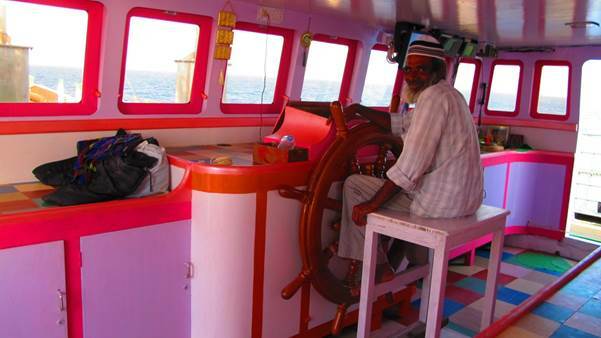 Noorealsalam lets her spring lines go and the large diesel engines rumble beneath our feet as the whole Dhow shakes. Its dark and we head out to sea leaving the glowing lights of the Berbera Port behind us. The Cows were silent all 450 not making a sound. 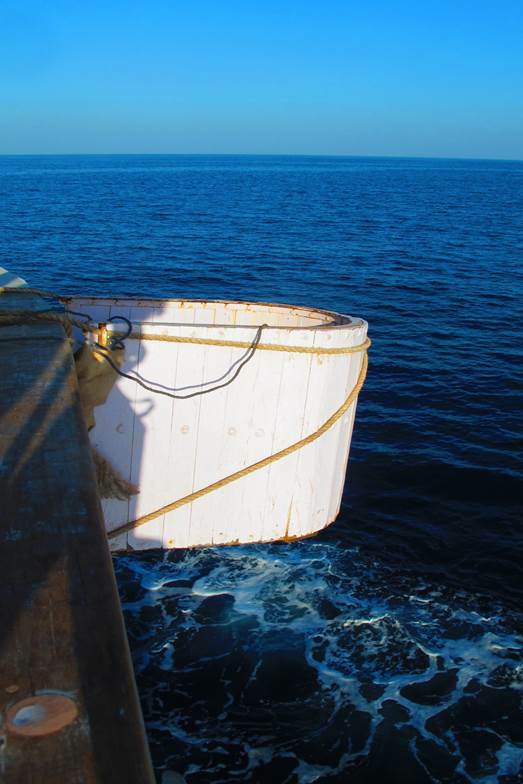 It was calm and flat the black sea breaking into a white wash as our huge wooden boat cuts through the darkness. We were shown to a communal cabin and given the best positions. Osman the Captain was chewing beetle nut along with the rest of the crew. This proved to be the most annoying part of the whole trip as every crew member chew this combination day and night it drove us insane as the carved their nuts scraping the sound resembling trying to start an old flint lighter. This ritual all happening right next to our sleeping bunks day and night every hour someone would be there scrapping and cutting the beetle nut. It was clearly an addictive drug and the whole presses taking 5 minutes before it was ready to chew. It was hard to sleep the whole night’s adrenalin still pumping around my body, everything was new, and everything was so different aboard this old wooden Dhow and its 13 crew members. I finally drifted off to sleep Elayne opposite me already sleeping. Our bunk floors were hard painted wooden slates our backs soon aching from the boat lifting and falling on the waves as we enter the deeper waters, every move I made to try and get comfortable made it even more unconfutable Elayne joining in the discomfort through out the night. Finally I drifted my back felt numb and I was just too tired to stay awake in this very strange environment. I wake about 4.00 am it is still dark and 2 crew members are scraping their beetle nuts into a chewing mush…I can’t believe going from our last Somaliland friends chewing small lush green leaves to our new Indian friends scraping chunks of nuts mixing it with a white cream, and them introducing a raw tobacco like substance rubbing all in some plastic glad wrap before introducing the combination into their mouths to start the chewing process. Their teeth resemble red stained rotten pegs even the young boys have the same problems all through the day and night they would squat next to our sleeping bunks open a cupboard below and start the whole procedure hour after hour every crew member. 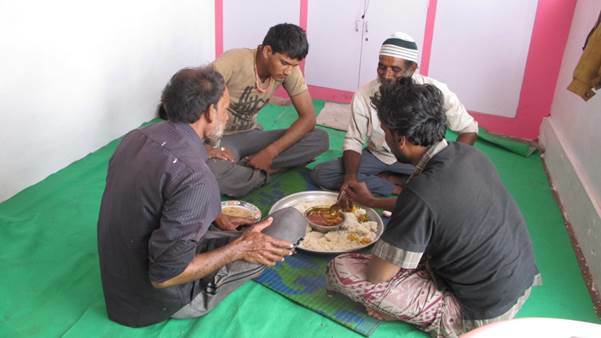 My ears wake to strange sounds, my nose wakes to strange smells, The wave motion getting more and more steeper the hiss of spray the Dhows bow lifting high and falling fast . I peer over to Elayne who is still asleep curled up on her side. I sit up on the edge of my bunk I can see the residue of scrapping beetle nuts scattered over the green floor covers. The crew are up and about the dawn breaking, the cows mooing wanting something to eat, I awake to a very different world indeed. The Indian decor pink and vivid green strikes my eyes, such alien colours so different, my eyes squint in protest. I wave good morning to the helmsmen also sitting squat crossed leg on a wooden chair spinning the large wooden wheel the compass card swing side to side. He shakes his head in the typical Indian way side to side pointing to the weather. I gather the weather is not what they would have liked. 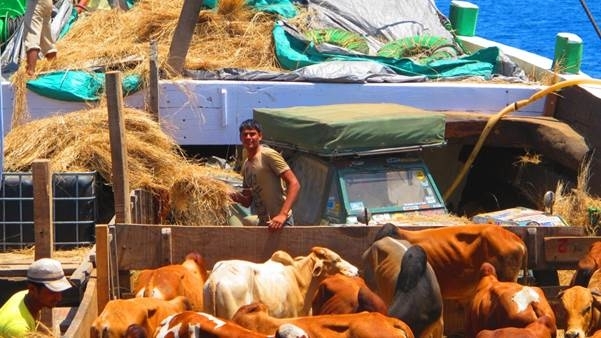 Elayne wakes and sits up we hug and take in our new very moving world……yikes Elayne exclaims it’s hard to stand up our sea legs far from being acquired our Dhow raising steeply the weather deteriorating the cows know the mooing and shuffling around becomes a constant. They to are trying to get their sea legs….Elayne exclaims…..yes I reply its getting a little rough, the waves now 2 metres high our Dhow shuddering as we drop into small troughs. The smell of cooking chapattis and curried chick peas draw us outside to join in with the crew members squat on the deck eating green chilli’s and spicy filled chapattis, hot sweet milky tea was handed to me and Elayne declined but I excepted the kind offer. All eyes were on us, some of the crew’s first view of these strange passengers with an even stranger car. The cook was in a small wooden box no more than a small dog’s kennel in size with one small entry away from the wind cutting across the decks. He sat crossed legged and was rolling fresh chapattis with cigarette in mouth puffing away the discarded ash finding its way into the freshly rolled chapattis as he rolled the fresh dough over a small raised mould. He rolled and cooked them in a robot action smiling and puffing away on his cigarette finally dropping them onto the small gas stove flipping them when they we cooked onto a pile by his bare feet. 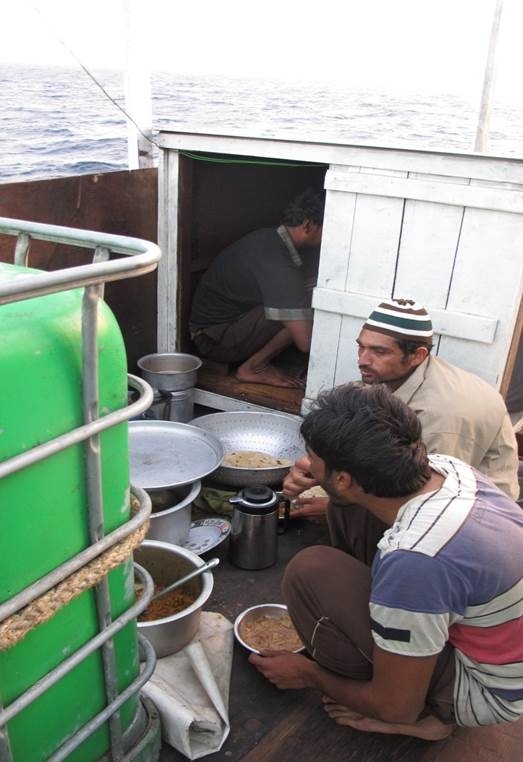 I really enjoyed the cooked curried chick peas and chillies although the sea actions was making my stomach a little unsettled, but what was really turning my stomach was the constant smell of diesel fumes which I know from many a yachting experience was not the best smell my stomach could handle. The sun eventually warmed us as we sat in our plastic chairs huddled next to the wheelhouse trying to find the least diesel fumes. We watched the poor cows struggling to find their footing slipping and sliding in the excrement they did not look happy and has re focused my thoughts on ever eating meat again……it really was a sad sight to watch. It was slow going checking my gps we had only covered some 120klm throughout the nigths passage, the weather not improving by dawn our Dhow struggling against head on winds and seas building. The swell had increased to 3mtrs the wind to 25-30 knots, up and down we crashed, the Dhow riding the waves superbly like a pitching bull but we had very little rolling. 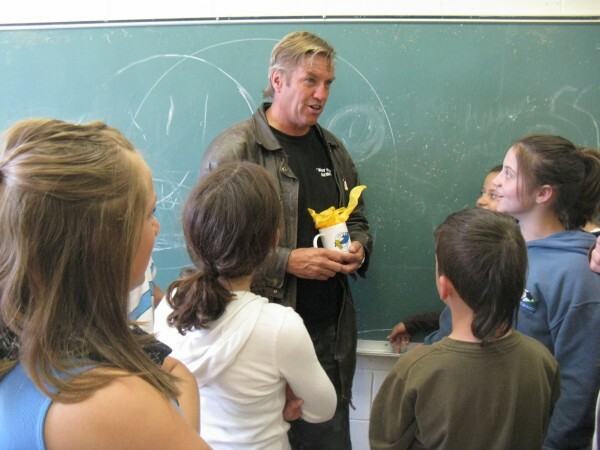 My stomach was getting worse and eventually I was sick with another crew member sending me off to the rails. It was not a bad case of sea sickness but the diesel fumes were making my stomach turn. Elayne stomach was at least ok but getting her new bucket and Elayne comfortable to use it as a toilet with my sea sick stomach was another issue, then having to empty the contents over the side and then retrieve some sea water to wash everything clean, proved to be a tuff call for my stomach. It was not long before I returned to our bunks only to find we have been given a new mattress which made Elayne’s bunk very desirable ….lol It was a God send as my back would not have taken another full night as the Dhows actions where even more violent as the weather worsens. 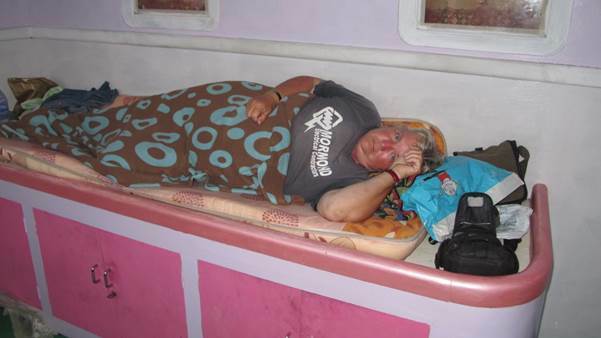 Elayne all snug in a rug on a Dhow…..yes you can see she is enjoying every moment in our communal cabin.